This is a joint giveaway cross-posted on Let’s Take the Metro and Natural Parents Network. You may enter at one site only. Please find the section marked “Win it!” for the mandatory main entry and optional bonus entries. I was so excited when I was given the opportunity to review a product from Mama’s Felt Cafe. 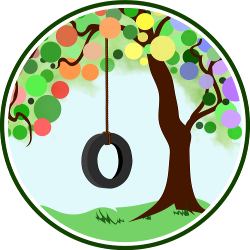 I came across her blog during the Carnival of Natural Parenting and was hooked instantly. Seeing her ideas was like an ‘Ah-ha’ moment, and I realized I could take responsibility for the toys my children play with by making them myself. Of course since I do not have infinite time on my hands, getting a few felt originals to start my collection was like a dream come true. Brittany, owner of Mama’s Felt Cafe, sent me a “Support Local Growers” basket for my daughters to man-handle. The package contained: two carrots, two attached cherries, an eggplant, two pea pods (one that jingles and one that does not), a potato, a watermelon slice and of course the basket that says “Support Local Growers.” As I took out each piece and inspected it, I noticed how fine the stitching is and how every little detail of the real food is present in the replica. For instance, the potato actually has tiny “eyes” all over both sides and the watermelon rind is two-toned and striped to mimic the real fruit. I am someone who sews, though admittedly not that well, but I can tell that the quality of Brittany’s work is very high. One of the first things my almost 2 1/2 year old tried to do was pull off the “seeds” on the watermelon. She was completely unsuccessful and I think she will continue to be. 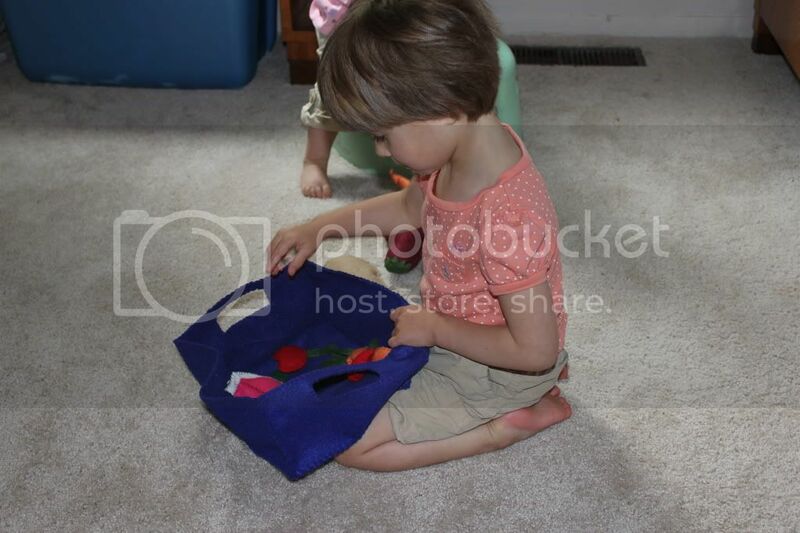 As far as everything else is concerned, both my daughter’s love to jingle the musical pea pod, carry different pieces around all the time, and even use the carrots as “phones.” This set is so versatile because every piece can be used in an infinite number of scenarios, and even the basket itself has tremendous possibilities. It is sure to inspire the cook or vegetable eater in every child. Digging in to the basket. I would certainly recommend this package to anyone who wants good quality, soft, yet durable play food for his or her children. You can feel confident that if your children want to chew on their felt food, they will not be swallowing a boatload of chemicals, nor will you need to be concerned if your child wants to take these huggable pieces to bed with them. You can definitely put this basket on your child’s next wish list. Interested in making some fruit for yourself? Mama’s Felt Cafe has put together a watermelon tutorial specifically for this giveaway! Visit Natural Parents Network this Monday, June 6 for her tutorial. 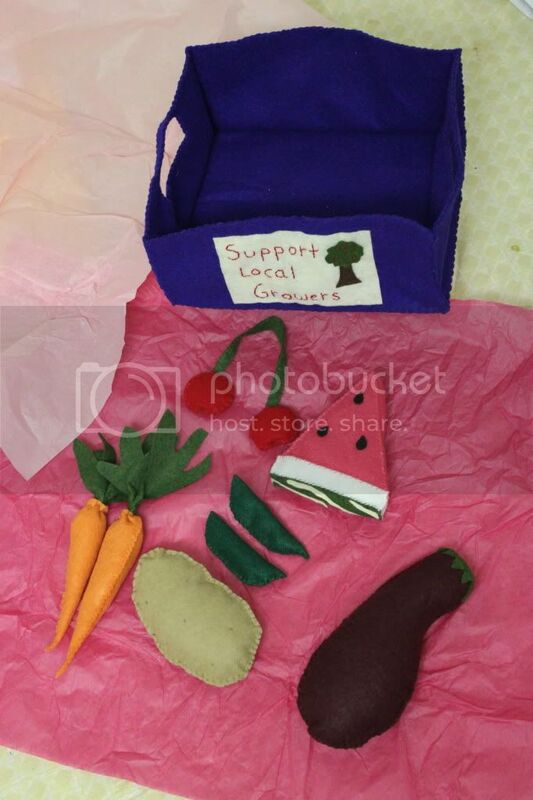 You can purchase a ‘Support Local Growers’ basket for $30 at Mama’s Felt Cafe on Etsy. You will have the option to choose which fruits or vegetables you’d like in your basket – how cool is that?! For your own chance to win a $25 gift certificate to Mama’s Felt Cafe on Etsy, enter in the comments below! Contest is open to US and Canada. MAIN ENTRY: Visit Mama’s Felt Cafe on Etsy and tell us what your favorite product is in her shop. This is a joint giveaway with Let’s Take the Metro, and Natural Parents Network. You may enter at one site only, and we’ll be recording IP addresses to ensure that there are no duplicate entries. That said, please do visit and enjoy both sites! Heart Mama’s Felt Cafe on Etsy and leave your Etsy user name in the comment. Tell us who you would give felt food to. Subscribe to Let’s Take the Metro in a reader or by email. Follow Mama’s Felt Cafe publicly through Google Friend Connect or subscribe to the Mama’s Felt Cafe RSS feed in a reader or by email (1 entry for each). Follow Let’s Take the Metro publicly through Google Friend Connect. Follow @MamasFeltCafe on Twitter and leave your Twitter name in the comment. Follow Let’s Take the Metro on Networked Blogs. Like Let’s Take the Metro on Facebook. Leave a relevant comment on a non-review article at Let’s Take the Metro and tell us which post (comment on separate posts for up to 3 entries total). Leave a relevant comment on a non-review article at Mama’s Felt Cafe and tell us which post (comment on separate posts for up to 3 entries total). Post this giveaway on your Facebook page or wall and leave the link (1 entry). You can use this status update: Win a $25 gift certificate to @Mama’s Felt Cafe from @Natural Parents Network. Contest ends June 26 and is open to US/CANADA. Enter another of the giveaways on Natural Parents Network. Contestants may enter at either Let’s Take the Metro or Natural Parents Network but not both. Entries will be combined for the drawing of a single winner. Our reviewer, Amanda, mothers two beautifully intelligent girls who are fifteen months apart and never cease to keep life interesting. She loves to garden, cook, sew and research everything green. Since the birth of her first daughter, she has been systematically growing greener and has no plans to stop any time soon. She writes about as many different things as she can think of at Let’s Take the Metro. I like the Heart Shaped Whole Wheat Peanut Butter and Jelly Felt Lunch at Mama’s Felt Cafe on Etsy. I would love to give some of Mama’s Felt Cafe items to my 2 year old daughter! I like Let’s Take the Metro on Facebook. I like Mama’s Felt Cafe on Facebook. I really love the pancake felt food breakfast!! I would give this to my daughter. Her imagination has been awesome lately and she would have a blast with it. I like Mama’s Felt Cafe on GFC! I follow Let’s Take the Metro publicly through GFC as Solducky.